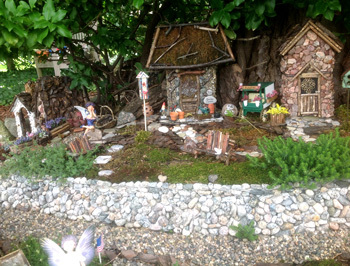 This featured fairy garden belongs to Susie Corker of Lake Orion, Michigan. The charm of this garden is in the many details that blend seamlessly into the little landscape. Hidden paths lead to secret gardens. 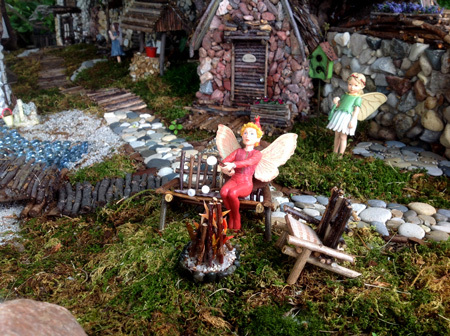 Tiny stone cottages give shelter to little fairies who enjoy the campfire, complete with roasting marshmallows. There are miniature signs which give a nod and a wink to familiar places around the community of Lake Orion. A log bridge crosses over a “pond” made of blue glass marbles. The pond is even surrounded by a sandy beach! The more you look, the more details may be found! A tiny basket of firewood is ready to be carried into a cottage. A flamingo stands guard outside an entryway surrounded by miniature summer blooms. Twig archways share a stone path with miniature live plants, moss, and herbs. Birds flit about outside a “garden center” which also has a plant cart with flowers for sale. A small gnome peeks around a corner of a building. A beautiful hand crafted stone retaining wall holds back the earth so it doesn’t wash onto the tiny pathway below. Every building has unique details in the windows, doors, roofs, and porches. Don’t miss the little stone church complete with arched, stained glass windows and an arched double-entry front door. It rests under a huge shade tree—a quiet place to worship. Just outside a little fairy child plays on the rocks. 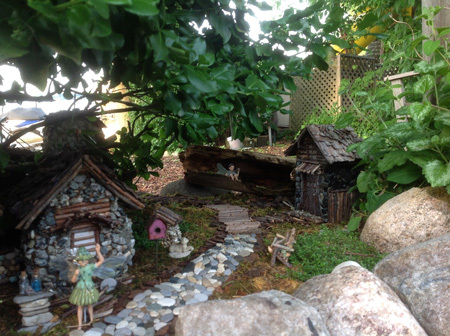 Susie writes, “This is my fourth summer of fairy gardening. 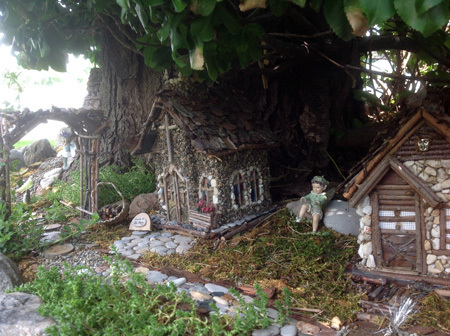 It has grown from one fairy and house (with fences) in a whiskey barrel, to this year’s rock garden of thirteen hand crafted houses, two tree houses, many fairies, walkways, a pond, landscaping, retaining walls, and numerous accessories. I have also started a second area, a ‘Princess’ statuary garden, with balcony, wishing well and more. Most of my houses start with a re-purposed home-dec birdhouse as a base. 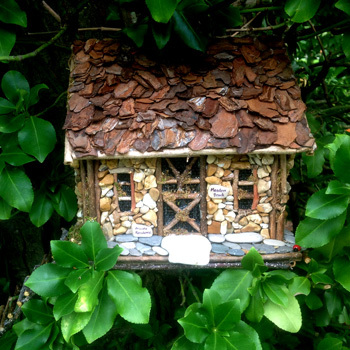 Roofs are bark; siding: twigs and stones. Northern Michigan and my yard are the main sources for my supplies. Our Great Lakes shorelines offer an abundance of fossil stone and many beautiful rocks and minerals, including Petoskey stones. I use a waterproof roofing adhesive and lots of quick drying waterproof craft glue. My garden is extremely water resistant, sprinklers and rain have not been a problem. For our Michigan winters, I pack the houses away in a dock box… So far only minor repairs on the houses and landscaping allow for the new expansion and improvements. 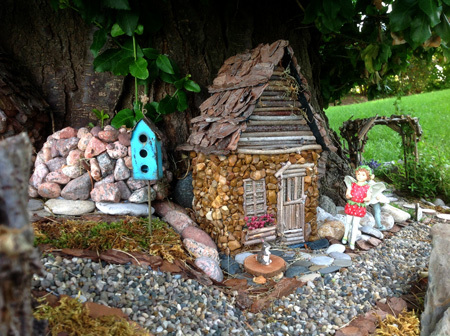 I would love to feature your garden, whether large or very small, to inspire other fairy garden enthusiasts. Those of us who love small-scale gardens and scenes will appreciate the work and creativity required to make these wonderful little places.